Superpowers should theoretically make a person more interesting, but the Inhuman characters on Marvel’s Agents Of S.H.I.E.L.D. are the blandest members of the cast. The writers of this series have struggled to give Chloe Bennet a character that brings out the charisma she shows in her public appearances, and while Skye/Daisy has gone through a significant transformation, it’s not one that highlights Bennet’s natural charm. (Grant Ward is a solid example of a character course correction that takes advantage of the actor’s strengths, and Brett Dalton has been much more fun to watch since his character became a slimy maniac terrorist.) Bennet isn’t especially convincing as a serious secret agent or tortured Inhuman, but I believe there’s potential for Bennet to blossom as a performer if the writers found a way to let Daisy enjoy herself every once in a while. Right now, Daisy’s entire life is dedicated to S.H.I.E.L.D. and rescuing Inhumans, but it wouldn’t hurt to get a glimpse of what she does outside of work. What is her personal life like? Does she wish she could just be a regular woman in her early ’20s, trying to find her way in the world without alien powers and government organizations at her back? Now that she has control over her superpowers, does she ever have any fun with them? I’d love to see this show answer these questions, but that’s not the kind of show Agents Of S.H.I.E.L.D. is. It’s a show that maintains high stakes at all times because that’s what the creative team thinks viewers want from a superhero movie tie-in series, bypassing character complexity to devote extra attention to the threat of the week. The ATCU is back in action in “A Wanted (Inhu)Man” and on the hunt for Lincoln, the other half of this series’ boring Inhuman pair. Luke Mitchell has dreamy puppy dog eyes and looks nice with his shirt off, but his performance is severely lacking in intensity. A recovering alcoholic on the run from the U.S. government because he has alien abilities that allow him to generate and control electricity, Lincoln has all the makings of a team hothead, but Mitchell’s performance lacks the aggression and desperation that would bring out that side of the character. After an exciting opening chase sequence that ends with a spectacular display of Lincoln’s powers, Mitchell slips back into his default “broody-pretty” mode, and stays there for pretty much the entire episode. Daisy and Lincoln solidify their romantic relationship with a kiss during the rescue mission, but the tepid chemistry between the characters makes their union feel like a forced move to create emotional stakes for Daisy when Lincoln is taken into ATCU custody. The real chemistry in this episode’s main plot is between Coulson and Price, who ultimately decide to join forces instead of competing for rogue Inhumans (lending more credence to my theory that Coulson will be this season’s Big Bad). Constance Zimmer brings an authoritative presence to Rosalind Price that Coulson is clearly attracted to, and she has a talent for humanizing characters that could easily be over-the-top villains. (See: this summer’s Lifetime hit UnREAL.) When Price tells Coulson that she needs to bring in an Inhuman to satisfy the demands of her work, her character opens up and become significantly more sympathetic. Zimmer’s performance gives the impression that Price isn’t a manipulative mastermind but a pawn that is simply doing the job assigned to her by the U.S. government, and while that may very well be a mask, it’s enough to convince Coulson to side with her. While director Garry A. Brown does competent work with this week’s action-heavy episode, the plot is much better suited to the strengths of last week’s director Kevin Tancharoen. I don’t know how directors are assigned to episodes, but putting Tancharoen on a quieter chapter when there’s an action extravaganza on deck is a puzzling decision. May and Hunter’s entire subplot is about beating people up as part of the Hydra initiation, and Tancharoen’s skills for choreographing and filming thrilling fight sequences would have made those scenes even better than they already are. The final plot of “A Wanted (Inhu)Man” focuses on Simmons’ uneasy adjustment to being back home after spending months fearing for her life on an alien planet, and it’s an effective story thanks in large part to the strength of the FitzSimmons relationship. Iain De Caestecker and Elizabeth Henstridge have developed a strong rapport, and it’s nice to have them back together because they bring so much warmth to the show. Adrienne Palicki fits surprisingly well into their established dynamic, and the Fitz-Bobbi relationship is quickly shaping up to be one of the most interesting of this season. They switched roles when Fitz became the rogue agent and Bobbi became the lab scientist in rehab, and they’ve depended on each other for support as they acclimate to their new positions. 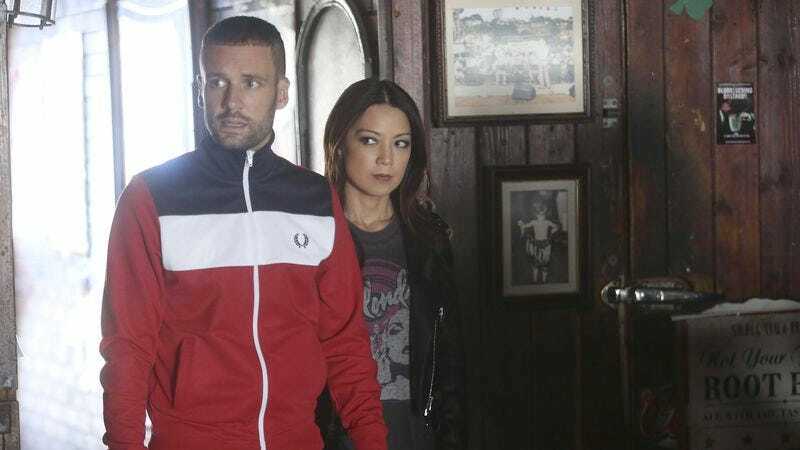 This week, Bobbi offers Fitz advice on how to move forward with Simmons, telling him to have patience and focus on the future instead of reminding Simmons about the past. He takes her on a date to the restaurant they had a reservation at before she was sucked into an alien portal, and while Simmons is touched by the gesture, she’s not able to fully enjoy it because her nerves are still so raw. The restaurant is empty to cut down on distractions, but it’s unclear what will set Simmons off. A glass of red wine makes Simmons break down and cry, and Henstridge’s performance captures the full weight of the trauma she experienced on the other side of the portal. Something horrible happened there, so why does she need to go back? The Daisy and Lincoln thread of Monica Owusu-Breen’s script doesn’t do much to make the Inhuman cast members any more captivating, but it’s a strong episode for the rest of the agents. Hunter and May’s infiltration of Hydra is shaping up to be a highly amusing look at the terrorist group’s structure, Simmons’ homecoming is rich with emotion and has a welcome hint of sci-fi mystery, and Coulson has an opponent that he admires as much as he doubts. Unfortunately, all of these subplots are tethered to the uninspiring Inhuman plot, and the writers need to find a way to make the show’s superpowered characters more interesting if they’re going to dominate this season. As much as I’m enjoying Bobbi as a supporting player in Fitz and Simmons’ story, I’m more than ready to see her back in the field and busting heads. I understand that the longer she’s kept out of commission, the bigger the impact when she inevitably comes back, but when you have an actress like Palicki that can play a convincing action heroine, it’s a waste to keep her cooped up in a lab. For a short while, I thought that Simmons’ heightened reactions to minute stimuli suggested she had heightened senses from her time on the alien planet, but I don’t think that’s the case. I do want it to be the case though, because Simmons with superpowers would be fun. I’m getting a lot more chemistry off of Daisy and Mack than Daisy and Lincoln, although I think Mack is supposed to be more of an older brother for Daisy. I could see that changing.